Plex has come a very long way over the years, but it has lacked support -- for some inexplicable reason -- for podcasts. Today this changes with the arrival of not just a podcast feature, but also a new look, highly customizable mobile app for iOS and Android users. For the time being, podcast support is in beta, but it is a feature that is available to all users -- there's no need to be a paid-up Plex Pass subscriber. Things are a little basic for now, but they're going to improve. Let's take a look and see what this latest update has to offer. Podcasts first. Writing about the long-awaited arrival of this feature, Plex says: "we like to use every part of the media and hate it when good content goes to waste. That's why we’re adding support for the incredibly rich and diverse body of content that is Podcasts". The beta version of podcast support is available on iOS, Android, Roku and the web version of Plex, with more platforms promised in future. Offline playback is planned for mobile users too. 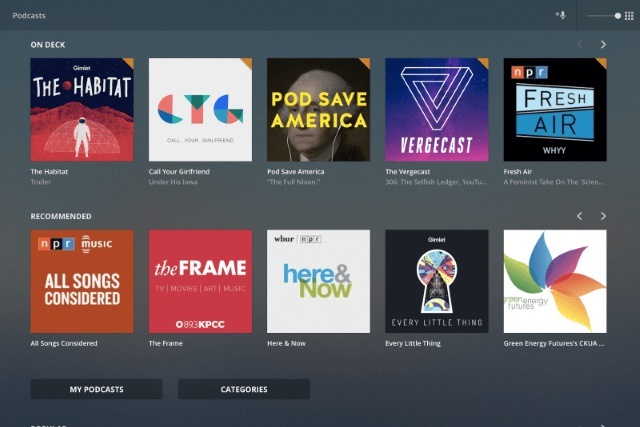 There is, of course, the ability to search for podcasts, and Plex uses machine learning to determine the sort of content you like to listen to and use this information to suggest other podcasts you might be interested in. Your favorite podcasts can be added to the homescreen for easy access, and you can start listening to a podcast on one device before continuing on another thanks to synchronization. Customizable Home Screen: You now have complete control over the home screen of the app: you can reorder (or remove) any of the sections (like "Recently Added" or "On Deck") or add new ones from anywhere else in the app, even across different servers (mix and match!). Easier Top-level Navigation: We've added tabs at the bottom of the screen to quickly navigate between media types (Movies, TV, etc. ), and those are fully customizable as well. Do you always watch movies on your tablet and listen to music on your phone? Arrange the tabs accordingly. Don’t care at all about photos in Plex? First of all, you’re a monster, but hey, now you can turn 'em off and focus on the media you prefer. Effortlessly Cross Server Boundaries:The default source for each of the media types can be customized as well. Have content split across multiple servers? Rely on your friend's hipster music? Or maybe you're a huge fan of podcasts. The app update is rolling out to iOS and Android users today.